Abroma radix HPI 3D 5.0% v/v, Janosia ashoka HPI 1D 1.0% v/v, Helonias dioica HPI 3D 0.5% v/v, Hydrastis canadensis HPI 2D 0.5% v/v, Viburnum opulus HPI 3D 0.5% v/v, Pulsatilla nigricans HPI 5D 1.0% v/v, Syrup 20%, Purified water & excipients Q.S., Alcohol content 5.36% v/v. 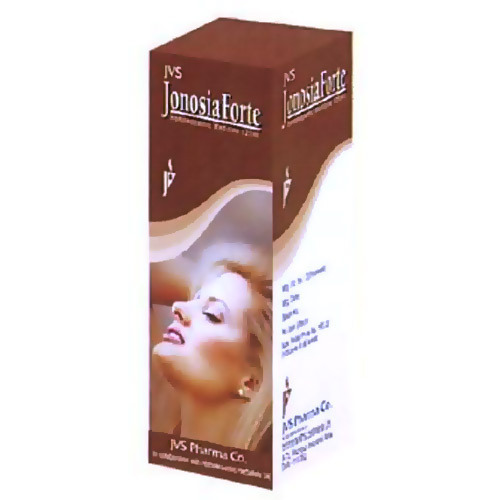 Tones up uterus, helps in relieving cramps/backaches, functional corrective in female, effectively regulates menstrual rhythm and normal functioning of uterus, useful in menorrhagia, dysmenorrhoea and leucorrhoea. India is a country where we take pride in being defined by our innumerable realities and variations. Similarly, our company, The JVS Group, functions in several areas with the aim of reflecting talent, integrity, capability and possibility in as many fields as possible and delivering envisioned business promises. Having come into existence in 1956, we have spanned the decades on foundations of excellence, uncompromising work ethics and professional integrity. As a testimony to our values, today we are a group that is identified with quality control, product reliability, customer satisfaction, commitment to merit, state-of-the-art research and infrastructural components. Our products reach out across nations and continents. Be it in the field of improving the health of citizens or ensuring better food, providing improved living spaces or manufacturing machinations, contributing to the environment or developing cosmetic nurturance, the JVS group makes its presence felt through its unassailable commitment to the best. We believe that excellence is an ongoing journey, and therefore as travelers on that road we cease to continuously improve ourselves through research, practice, advice and upgrading. We have always tried to ensure the best to our customers, be it in terms of our products, our pricing or our accessibility, and are government suppliers in many areas. And judging by the wide popularity as well as trust that we have succeeded in generating, we are today proud of the uncompromising work ethics and professional integrity that JVS has come to be associated with. From the basic to the peripheral, from the personal to the national, from the essential to the luxurious, we are a company that celebrates, enhances and contributes to the variety of human living. The 21st century is a century of speed and instant satisfaction – fast cars, fast food, fast solutions. Yet, as more and more people are realizing, there is much of value in the time-tested ways and solutions based on the adage of slow and steady. This philosophy is particularly true in the context of alternative medicine systems like homeopathy that seek to heal, sustain and enhance human health. In this area, our company JVS Pharma, in Technical collaboration with Homeopathic Herbal UK, is also seeking to make a contribution and a difference. The word Homeopathy, the basic principles of which were recognized by Hippocrate as early as the 5th century, originates from the coming together of Greek words homeo (similar) and pathos (suffering). Keeping in sync with our aim of customer satisfaction and authenticity, even today we prepare remedies using the traditional Hahnemannian technique of hand trituration and potentization, accompanied by stringent quality assurances and expert advice from our team of qualified Homeopaths. Due to these factors we have over 2000 homeopathic remedies available in a variety of potencies and form, ranging over oral liquid remedies, tinctures, dilutions and creams. In addition, our homeopathic medicines are renowned for being safe, non-toxic and non-addictive. To ensure that our manufacturing is in accordance with a strict quality assurance programme and good manufacturing practice, JVS Pharma Co. has been licensed by the Drug Authority of India and has a license number of 23/homeo. By trying to make the benefits of this comprehensive system of medicine available to as many people as possible, we have succeeded in creating an effective and reliable synthesis of traditional knowledge & modern science, within the larger paradigm of human wellness.